The kit is bluetooth remote control smart car kit that is designed for Arduino development. Every step has a clear graphic explanation, so the installation is very simple. It contains an Arduino Nano compatible PCB chassis that can be easily installed with Arduino Nano or other compatible motherboards. 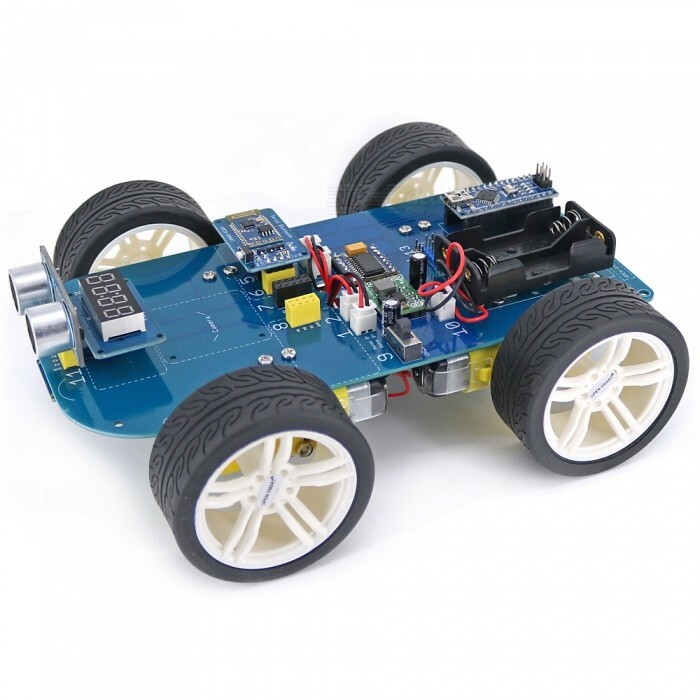 You can follow the installation tutorial and video to assemble the car, and each step has a clear graphic explanation, the installation is very simple. Gear motors and battery holder are all XH-2.54 connectors, so you can plug them directly onto the corresponding white socket on the chassis. After installation, please follow the operations in the tutorial video, so you can directly use the android phone to control the car. In addition to use the touch buttons on the APP page, you can also use the gyroscope control built in the phone. For Android, you can use app (Bluetooth RC Controller) download from Google Play store. For iOS system, we have used iPhone7 iOS 12.0 with BLEJoyStick APP installed from apple store to control the car. Easy to plug the modules onto the pin headers on the PCB without any dopont cables. 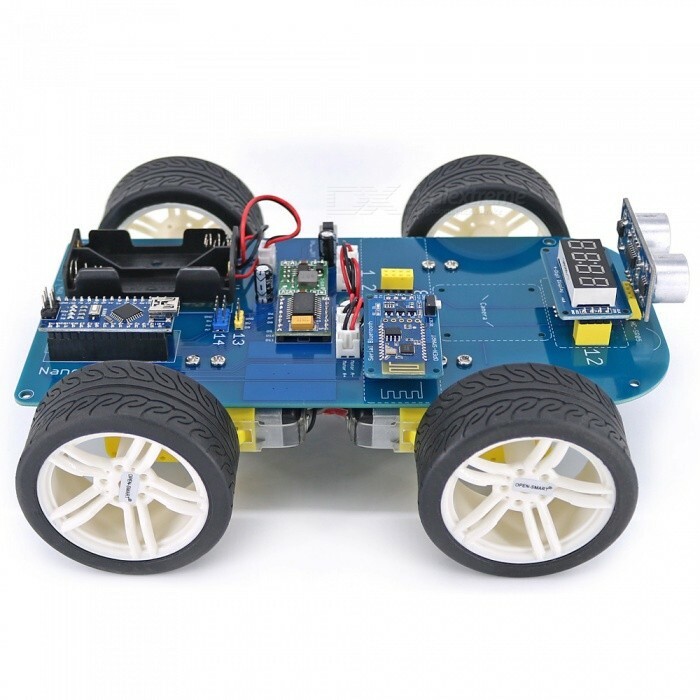 The kit can help you learn Arduino programming and learn how to make interesting projects, such as ultrasonic distance measurement and display, ultrasonic obstacle avoidance, bluetooth remote control smart car. NOTE: The car will be shipped disassembled. 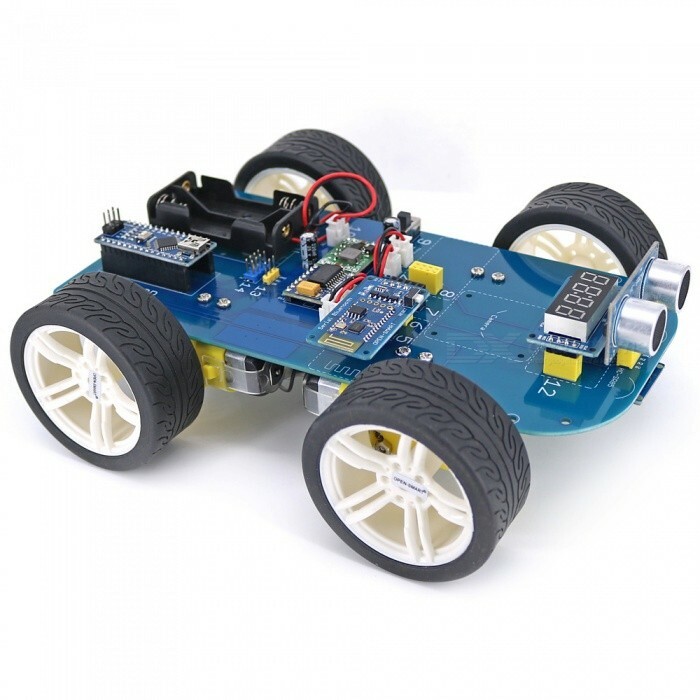 – You can use the included bluetooth wireless transceiver module, and instead you can use other wireless modules such as infrared, 433M remote control kit. – Bluetooth protocol: Bluetooth v3.0 SPP + v4.2 BLE, SPP is only for android, BLE is only for iOS. – The Bluetooth default password: 123456.